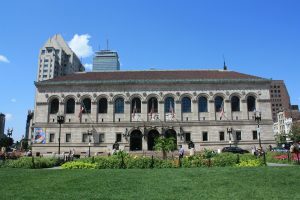 The Boston Public Library offers daily tours highlighting the architecture of its famed Central Library buildings by Charles Follen McKim and Philip Johnson as well as the art treasures within, including works by Daniel Chester French and John Singer Sargent. Free public tours are offered to visitors by trained volunteer guides. Please note that unauthorized guides are not permitted to lead tours within the library. Tours last approximately one hour and begin from the McKim Building vestibule, through the library's Dartmouth Street entrance. If your party is smaller than 8 people, you can join the public tour without a reservation. For parties of 8 or more people, please refer to information on private tours below. Please see the library's scheduled holiday observances: tours will not occur on these dates. Private groups of any size up to 60 people may request an Art & Architecture tour start time outside of the daily public tour times until 5 p.m. between Monday to Thursday, and until 3:45 p.m. between Friday and Sunday. Individual parties larger than 8 people are not permitted to join a public tour and must schedule a separate private tour. A minimum lead time of four weeks is required for private tour requests; bookings are subject to guide availability. Each guide can accommodate up to 20 visitors; a $100 fee per guide applies. An invoice will be sent to the billing addressee listed on the tour request form. Please note that at least 24 hours’ notice is requested in order to issue a refund for cancelled or rescheduled tours. Tours last approximately one hour and begin from the McKim Building vestibule, just through the Dartmouth Street entrance. If you would like to book an Art & Architecture tour as part of your event at Boston Public Library, please contact the Special Events Office for more information. Please note that tours held outside of our normal private tours hours are subject to a $200 fee per guide. 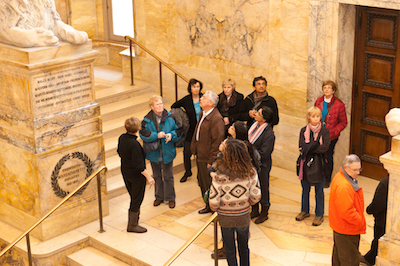 If you are a teacher or professor planning to bring your students for a self-guided Art & Architecture tour of the Central Library, please contact the Tours office at tours@bpl.org or 617-859-2216 to register your group (please allow a minimum of 3 weeks before your planned tour). 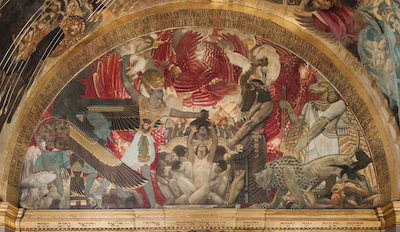 If your student group prefers to arrange a private Art & Architecture tour with a BPL guide, please refer to the section on Private Tours above. Any student group attending a private tour must provide one adult chaperone per 10 students. The tour material is currently recommended for middle-school age and above. School groups seeking a tour of the library's collections and/or services for students should contact the Children's Libraryopens a new window, Teen Centralopens a new window, or the Research Services Department. Please note that unauthorized guides are not permitted to lead tours in the library. All group tours must be led by an approved BPL-trained guide or staff member. 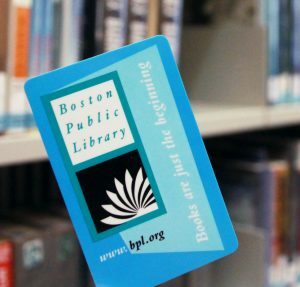 For information and policies on groups, please contact tours@bpl.org or 617.859.2216. For more information about art and architectural points of interest in the Central Library, please visit our art & architecture page. While attending Art & Architecture tours, you can expect an hour of walking and standing throughout three floors of the McKim Building. Every floor is reachable by elevator if you are not able to use the stairs. The Dartmouth Street (McKim Building) and Boylston Street (Johnson Building) entrances are both accessible. Please note that tours begin in the McKim Vestibule, just through our Dartmouth Street entrance. If you are unable to bring your own wheelchair or have any questions about accessibility on our tours, please email tours@bpl.org or call 617.859.2216. For more information about the program requirements and the responsibilities of volunteer Art & Architecture tour guides, please refer to the position overview (PDF). While we are not currently recruiting volunteer Art & Architecture tour guides, you are welcome to submit an application for consideration in the future. Interested candidates should complete the application (PDF) and send to tours@bpl.org or Tour Guide Program, Boston Public Library, 700 Boylston Street, Boston, MA 02116.